Last Thursday a Massachusetts oil tycoon named Dan lost his final dollar. He did not even possess an extra nickel for the jukebox, so he decided to depart on safari. He packed his rucksack, duffel, and tote bag, put on a khaki suit and a plaid bandana, and bid his bungalow adios. He trekked a couple hours and paused for refreshment. He devoured bananas and barbecued beef with catsup. He opted to drink lime soda, not tea or coffee, because caffeine irritated his nerves, but soon he became anxious anyway. He was terrified of cougars, coyotes, jackals and alligators, and especially bandits, hoodlums and thugs. He was not naive, but in kindergarten he had read too much about ninja assassins. It bothered him. 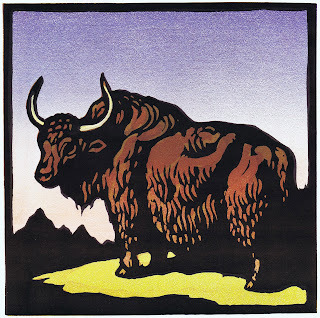 First the only animals he observed were a gecko and an ebony and ivory skunk, but suddenly a horde of yaks galloped up in a stampede. Fortunately, it did not take a sleuth to deduce they were coming. Without panic, Dan hid behind a hickory tree. When it was over, he was beat -- a zombie from exhaustion -- and he stumbled home, put on his flannel pajamas automatically, like a robot, and slept. Okay, it isn’t the finest literature, but the question is how many loanwords do you see in this story? You presumably noted adios and ninja, perhaps naive and Massachusetts. Maybe you found ten or even twenty more… This story uses 135 unique words, of which 60 (44%) are borrowings into Modern English, and another 29 (21%) were borrowings into Middle English. Moreover, those 89 loanwords - yes, 89 - were borrowed from more than 33 different languages. So, 65% - considerably more than half - of the words in this story are not actually native to Old English. Now that’s a language that likes to borrow! One perpetual note of caution: etymology can be very difficult to pin down, and a few of the words in here are uncertain or debated. I tended to go with the interpretation that would swell my count, just to make my point, so it’s fair to say that there’s a margin of error of a few percentage points in either direction. Still, the conclusion is valid: people accuse English speakers of failure to learn other languages, and in all seriousness I absolutely agree that we need to do better. But give us credit - even when we speak only English we’re speaking dozens of other languages, too! [Pictures: A Horde of Yaks! 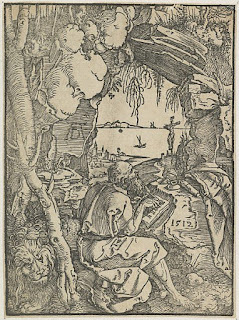 September 30 is St Jerome’s Day, in honor of which I have several of Albrecht Dürer’s depictions of him. 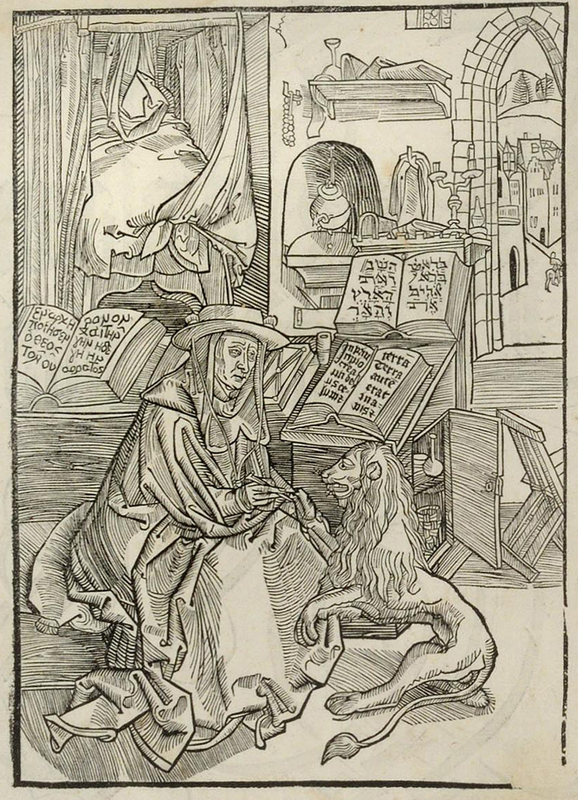 I don’t think Jerome and I would have been best buddies back in the day (347-420 CE), but he is the patron saint of librarians and translators and is said to be the Church’s first linguist, so I’ve got to cheer that. He’s also famous for befriending a lion by removing a thorn from its paw a lá Androcles, so points for kindness to animals. 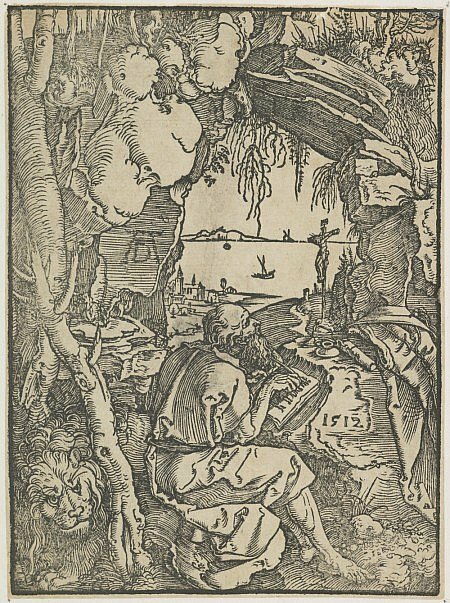 At any rate, Albrecht Dürer (Germany, 1471-1528), most famous of renaissance printmakers, illustrated the life of Saint Jerome numerous times - more than he did any other saint (at least, not counting Jesus and Mary, I think). case is off his head, hanging on his back. Historically in Jerome’s time cardinals hadn’t been invented yet, but he was traditionally depicted as a cardinal because he was effectively the secretary of a pope, a role which by the renaissance was generally held by a cardinal. 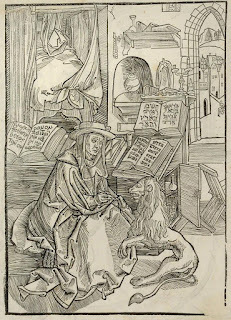 Compare now with Dürer’s earliest known book illustration, in which Jerome is in the act of pulling the thorn from the lion’s paw. Dürer was younger, and so was Jerome - he doesn’t yet have his long beard. You can tell this is an earlier effort, much simpler and more awkward. In fact, it looks almost medieval with its not-quite-right perspective and anatomy, and its areas of more-or-less empty space. 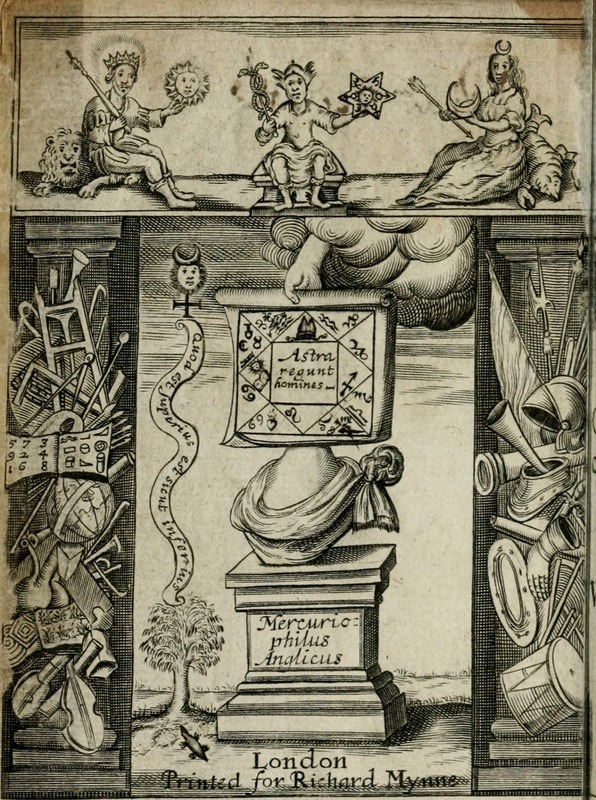 Still, though, there’s a wealth of detail, including the unique touch of Jerome’s books in Greek, Hebrew, and Latin, for which he was famous. Note also that he’s dressed in the robes and hat of a cardinal, this time more obviously. My third example shows Jerome as the ascetic as much as the scholar, living in a cave with civilization off in the distance. 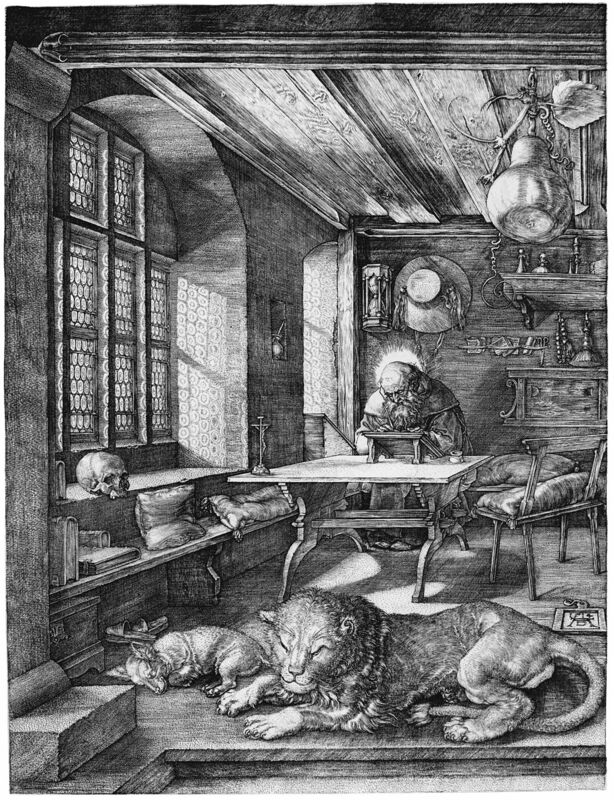 The lion, unusually, seems to be prowling about instead of resting peacefully by the saint’s feet, and the cardinal accessories are heaped on the rock Jerome's using for a desk. Jerome’s writing hand looks dreadfully awkward, but I love the framing of the cave with its rocks and plants. translation of Jonah’s plant in the Bible was a gourd or, as Jerome claimed, ivy. 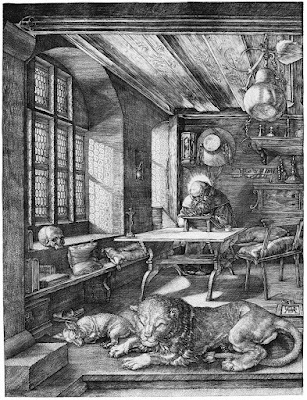 The humanists of Dürer’s day were fond of the story of this debate as illustrating Jerome’s profound scholarship. As an artist I sometimes think it’s boring to do the same subject multiple times, but Dürer manages to do something a little bit different each time he comes back to Saint Jerome. Last post I mentioned my childhood habit of crafting fictional narratives to accompany my ordinary life. Just for fun, here’s a short story I wrote in high school (c. 1991) illustrating that habit as it might accompany a walk home from the library on a winter’s afternoon. It took all of her strength to keep her hand from trembling with nervous excitement as she handed her card to the man behind the bare grey counter. 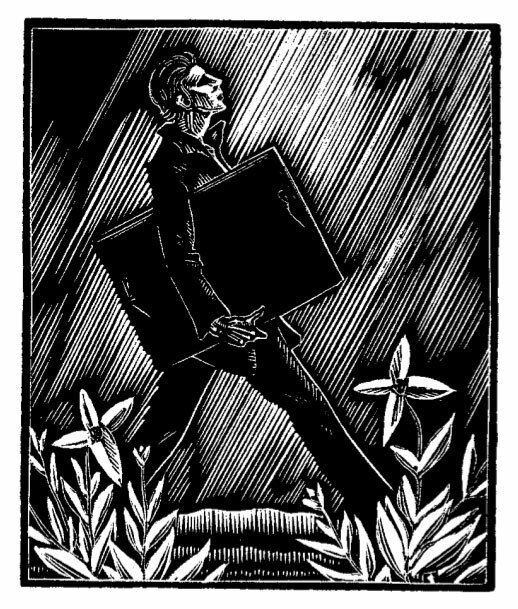 The thin-lipped man peered suspiciously over frameless spectacles, then stamped the papers and handed them back. “You’ve got two weeks with these,” the man said, and looked to the next person in line. Putting her papers carefully away in her bag, she thanked providence that she had not been recognized — but only two weeks? She had only fourteen days to arrange the escape of an entire family and smuggle them to safety? She smiled faintly. She had rescued others in the face of even greater adversity, but she would have to work quickly. She hurried to the door and resolutely walked out. Out, out into the cold! The door closed firmly behind the poor maiden and she trudged reluctantly away through the snow. Darkness was falling with the powdery flakes. Warm, well-kept carriages dashed past in the street, but the waif was quite alone on the wet pavement where she walked. If the warm, well-kept owners of the carriages had stopped to look more closely at the ragged figure by the side of the rode, they would have seen the radiance in her beautiful eyes despite her destitution. But no one even slowed down, and the lovely maiden waited unnoticed for a break in the traffic. She pulled her ragged scarf tighter against the bitter cold. With the collar of her dark trench coat pulled up around her chin and the brim of her fedora pulled low over her face, she knew that she would never be recognized by the drivers of the long black cars that roared by the corner where she waited. She leaned her shoulder against the post of the dim streetlight, and the swirling snow obscured her figure almost as effectively as the wreathing mist that was usual in such scenes. She pulled the secret document from an inner pocket. Not one of the police experts had been able to decipher the code, but she hardly glanced at it before she knew its secret. They had all expected the decoded message to be in English, but she, with her fluent command of a dozen languages, instantly recognized what it said. The traffic light turned yellow as she swiftly decoded, “Après moi le déluge, soupe du jour. Bonjour, je ne sais quoi.” She smiled grimly under the brim of her fedora. “So the criminal mastermind thinks his big shot will deliver him the stolen goods. He’s in for a disappointment. I’ll catch him like a fly on fly-paper!” And she snapped her leather-gloved fingers triumphantly. At the snap of her imperious fingers, the crowds that had surged forward held back, leaving her a space in which to cross. “I need a dozen Raleighs here at least,” she thought as she stepped daintily but firmly from the curb into the slush of the street. 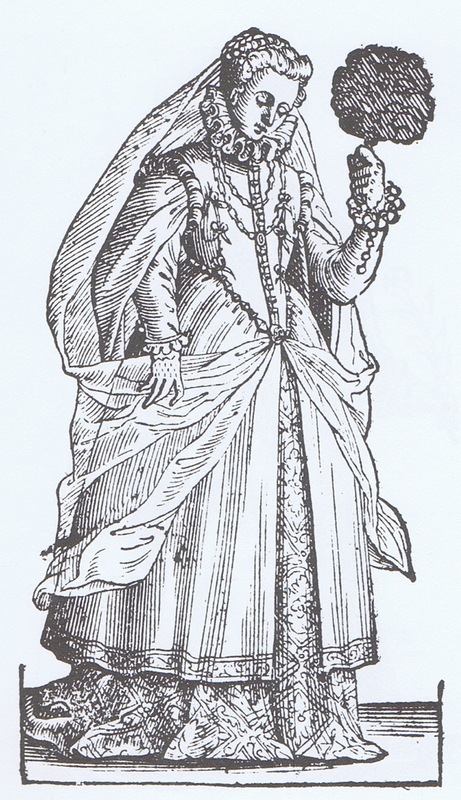 She walked regally, nodding graciously to her adoring subjects, and the air was filled with the white confetti these adoring subjects threw in her path. 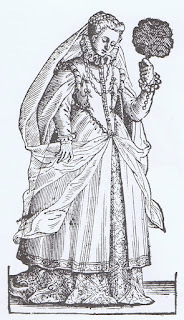 Amidst the roared cheers of the joyous crowd, she came to the steps of her palace and stepped out of the street. Her feet sank deep in the drifted snow, and she took out her compass and studied it a moment. She knew that she had nearly reached the South Pole, and when she was there she would be the first human ever to complete that cold and perilous journey. The snow swirled madly and the intrepid explorer had to push against the gusts as though they were walls of ice. All the others with whom she had set out on this polar expedition had long since perished, and now she knew herself to be utterly alone at the bottom of the earth. Then she saw the light hanging over the door. “It’s me.” She pulled off the arctic boots and unwound the ragged scarf. “Yeah.” She unbuttoned the trench coat, and hung the crown on one of the hooks. Then she went into the kitchen, closing the entryway door behind her. Whenever I was alone as a kid, I spent a lot of time in my head, and much of that time was spent narrating. Sometimes I put together the words I would use to describe what I was really experiencing - how I could weave into sentences the inexplicable antics of the squirrels, or the ridiculous decor in the corner house’s yard, or the color of the leaves against the shifting clouds in the sky. I worked and reworked mental drafts of how I could write it all down later in my journal, although generally by the time I was actually writing in my journal I didn’t have time to record that stuff anyway. Often I crafted more interesting, exciting, fantastical stories out of the raw materials of my mostly uneventful existence, and the more melodramatically romantic, the better. While I was cleaning the bathroom sink I might tell a story of the Cinderella-like Princess. While I was getting another box of cereal from the cellar I might tell about the Intrepid Detective exploring the dark and mysterious warehouse. While I was walking home from school in the snow, I might tell about the Poor Victorian Waif, or the Rugged Arctic Explorer, or the Winter Woodland Fox. Pretty much any time I was in a woods I’d be narrating something about elves. Perhaps this was the verbal equivalent of the stereotypical tourist so busy looking through the lens of the camera that he never sees the sights with his own eyes. Perhaps this was Walter Mitty losing his grip on reality. On the other hand, I think it often prompted me to be very consciously aware of what was going on, to note the smells and sounds and feelings in the moment, and to keep an eye open for the telling detail. It was also writing practice, of course, as I sought the best arrangement of the most evocative words to turn a description of my plain life into something that could catch at the imagination. For as long as I can remember, the urge to turn things into stories and to put those stories into words has been an ever present facet of making my way through my life. I still do it, with fewer Cinderellas and Waifs, perhaps, but an equal urge to find the words to craft a narration of what I’m experiencing. Is this normal? I have no idea - mine is the only head I’ve ever really been in, so I can’t compare it with what went on in other people’s heads when they were children. I suspect, however, that everyone in my generation and earlier had to find something to do inside their own head, because what else was going to happen while you had to walk home from school alone? I worry a bit that people no longer spend time in their heads. The moment they’re alone (and often even when they aren’t) they can plug their heads into earbuds and listen to music, or a podcast, or chat with friends. No one ever gets stuck with their own thoughts, or left alone with the world around them. No one is ever forced to be in their own head anymore; there’s always an option that’s easier, or more immediately appealing. Now, I don’t want to cry the catastrophe of change, the decline of the world, or the deficiencies of young people these days. There are advantages to balance disadvantages, and the human spirit adapts to do what it does in whatever environment it finds itself. All I can say with certainty is that when I was a kid I spent a lot of time in my head crafting narratives, and I can’t imagine being a person who had never done that. Tune in next time for a short story I wrote in high school capturing this habit of mine. 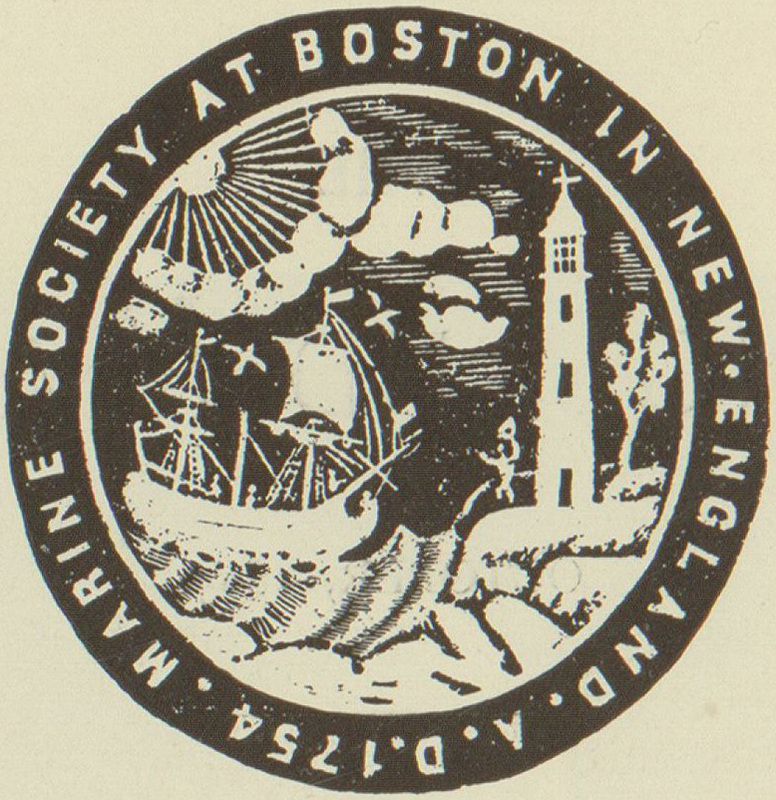 September 14 was the three hundredth birthday of Boston Light, a lighthouse on the Harbor Islands in Boston. It was the first lighthouse built in what would be the United States. 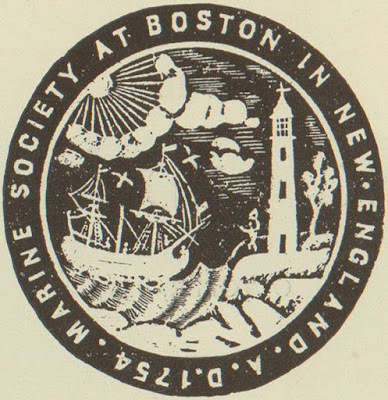 The original tower on the location was blown up by the British when they withdrew from Boston in 1776, and the second one, built in 1783, is the second oldest working lighthouse in the United States. I’ve lived in the Boston area for almost 20 years, and been to the Boston Harbor islands a couple of times, but I’ve never been to Little Brewster Island where Boston Light is located. I think you have to take a special ferry, although it is open to the public with tours by the lighthouse keeper, making it also the only lighthouse left in the United States with a resident keeper. It wasn’t automated until 1998, the last working lighthouse in the US to be automated. 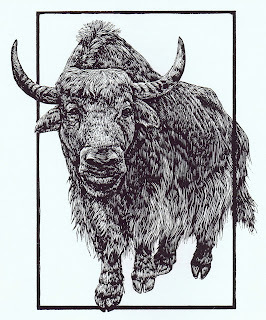 That’s a lot of “firsts” and other noteworthiness, and I thought its tercentennial was a good time to see what relief block prints I could find of this historic structure. Alas, I didn’t find as much as I’d hoped - it isn’t really a particularly famous lighthouse, considering all its claims to fame. Not so many people visit it as more accessible lights, and it hasn’t had much drama since it was reignited after World War II. Still, it’s a classic lighthouse on a scenic little island, and I hope it’s receiving plenty of love on its 300th birthday. So, what have I got? I’m charmed by this rough little block print of the lighthouse keeper waving a flag at the passing ship. (At least, I hope it’s passing and not heading smack into the rocks. It’s hard to tell.) Although the lighthouse and the keeper are both pretty rough, the ships has lots of detail, as do the waves, and there are even gulls flying around the rigging. The odd sun looks downright hieroglyphic. Is it meant to indicate that the sun’s rays are all being blocked by clouds? The first engraving dates to when the second tower was brand new. Only small boats are around, but you can see the keeper standing at the base of the tower with a telescope, perhaps seeing what vessels are on their way. 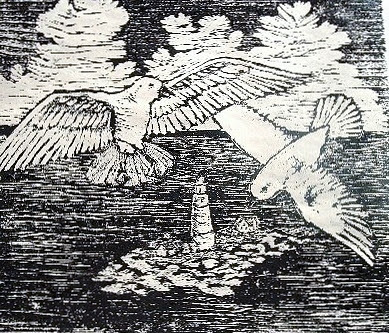 In the second engraving the keeper is not at work, but fishing off the rocks. Of course I don’t really know if this is meant to be the keeper, but there are records that the lighthousekeepers enjoyed excellent fishing from Little Brewster Island. I can’t find a date for this one, but my personal guess based on style is second half of the 19th century. 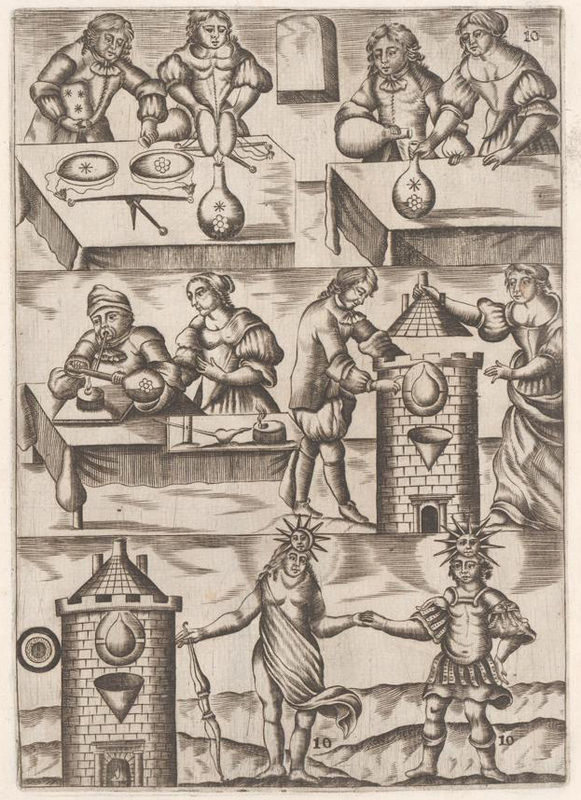 There is one technical printmaking detail to note: in the bottom center there is a blot poking up above a rock. 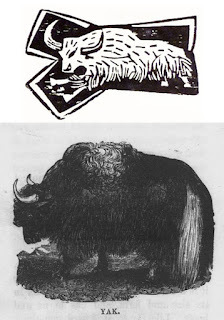 Clearly some little speck of dried ink or other foreign matter got onto the plate during printing, causing the characteristic black spot surrounded by white. 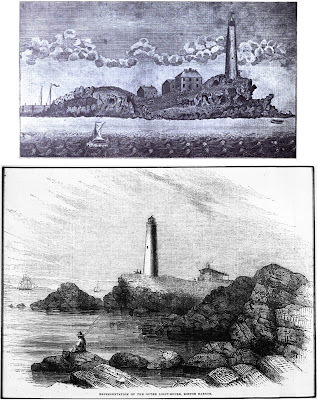 And finally, a modern depiction of the Boston Light today, and certainly the most interesting view. 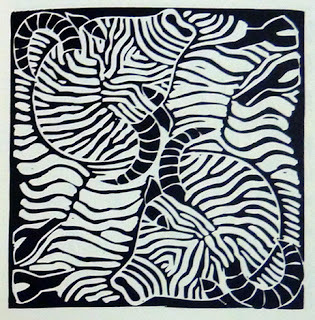 I’m sorry there isn’t a better image of this wood block print by Kathleen Tannian Sheehan. I wonder whether she used a photo taken from a plane. I don’t remember seeing the Boston Light while flying in or out of Boston, but it’s certainly plausible that some flight paths would go right past it. I’m always trying to think of new ways to show things that artists have already shown many times before, and I think it’s a great idea to give a gull’s-eye view of a lighthouse. 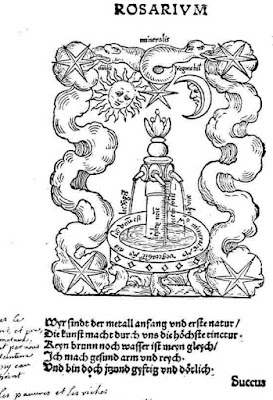 The philosopher’s stone is one of the premiere magical items in all of European mythology, with versions in Hindu and Buddhist mythology, and related Chinese concepts, as well. It was popularized by Harry Potter (despite the American publisher’s use of “sorcerer’s stone” because of their inexplicable assumption that readers in the USA wouldn’t be able to handle philosophers), and it has two properties with which people are most familiar: the ability to change base metals, such as lead or mercury, into precious metals such as gold or silver; and the ability to cure illness and prolong life indefinitely. Either of these properties alone would make the philosopher’s stone a major goal for many an alchemist, but there’s actually a lot more to it than just greed. As the most perfect substance, it is the original essence of Eden before the Fall and the key to understanding all the other elements of the world - religion and science all rolled into one. It symbolizes and confers enlightenment and even salvation. 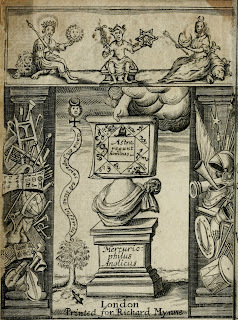 No wonder the search for the philosopher’s stone was the Magnum Opus - The Great Work - for more than thirteen centuries. To make the philosopher’s stone, let’s begin with Jabir ibn Hayyan in the eighth century. He reckoned that since all substances were combinations of the four elements (fire, water, earth, air) and their four qualities (hot or cold, wet or dry), one ought to be able to change one substance into another by shifting its basic qualities. Keep in mind that Jabir invented the process of dissolving gold out of ore with acid, a process still used today (with enormous environmental toxicity, by the way), so the idea of starting with base substances and ending up with gold isn’t really so farfetched. The philosopher’s stone can have a variety of appearances. It is often a clear reddish-purple stone like glass, which can be ground into a reddish-orange powder. It is heavier than gold and incombustible in any fire. A less-thoroughly matured version is white and is capable only of transmutations into silver. 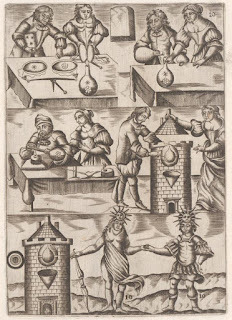 In addition to upgrading base metals and prolonging life, the philosopher's stone can also turn common crystals into precious stones, revive dead plants, make a lamp that burns forever, and create a homunculus. 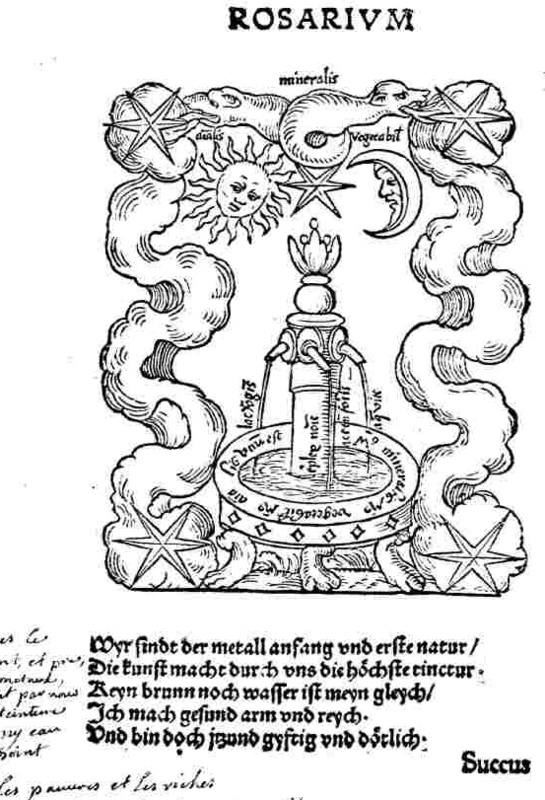 After about a thousand years of tinkering alchemists at work, Albertus Magnus may or may not have succeeded in discovering the philosopher’s stone. Given that he died in 1280, albeit at the impressive age of 87, and that shortly before his death he allegedly gave the stone to his student Thomas Aquinas - who died in 1274 - and given also that most if not all alchemical writings attributed to him were not, in fact, written by him, I’m going to guess that he never did discover it. Nicolas Flamel is another contender. 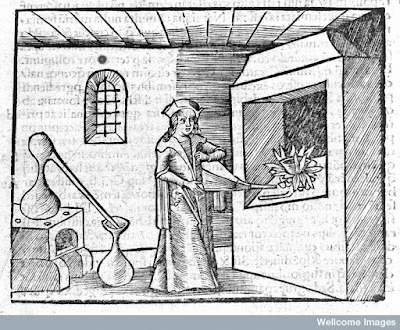 He may have discovered the philosopher’s stone, but if so, this is how it must have gone down: he spends his life in top-secret alchemical study, so that there’s no historical evidence that he was an alchemist at all. Some time around the age of 80, he succeeds in creating the philosopher’s stone, at which point, in 1410, he designs his tombstone and begins planning for his “death.” He fakes his death in 1418, and goes on to live in secret for two hundred years until the truth is revealed in an alchemical biography of 1612. Once the secret is out, he cannot avoid occasional sightings through the seventeenth century. According to Albus Dumbledore, towards the end of the twentieth century he gives up the stone and allows himself to die in order to ensure that the stone doesn’t fall into the hands of Voldemort. Here’s the thing, however: the philosopher’s stone really should be called a substance rather than an item, because it isn’t a single object. Theoretically any alchemist can make some of this substance if he or she only knows how. So who’s to say that there aren’t any other immortal alchemists out there with philosopher’s stones of their own? Perhaps you could be the next to make your own. All you need is a Junior’s Own Chemistry Set, a used copy of Mutus Liber or De Occulta Philosophia, and ultimate Enlightenment. I absolutely love the dance between naturalism and geometry in these works by Ray Morimura (Japan, 1948- ). 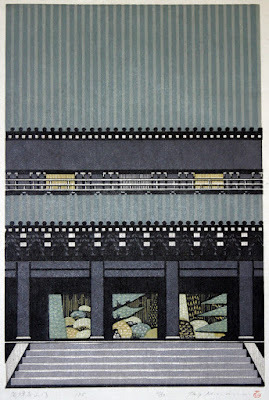 Morimura began as an artist doing geometric abstract paintings, but something really wonderful happened when he brought that sensibility to the traditional woodblock party! In some of his pieces there’s more realistic detail and perspective, while in others there’s more abstraction and geometric patterning, but they all have some of both. He tends to choose scenes in which the geometry of the objects is strong, and to arrange compositions that emphasize these geometric elements. 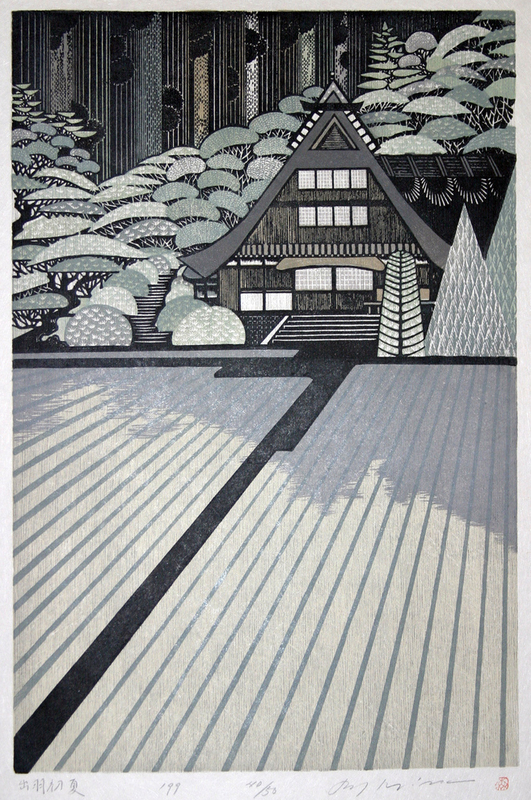 For example, in this image of the Nanzenji Gate he’s elevated the perspective so that we see as much of the roof as anything else, making the linear vertical arrangement of the tiles play off the linear horizontal lines of the steps, punctuated by the round ends of each row of tiles, and the round, patterned bushes showing on the far side of the gate. 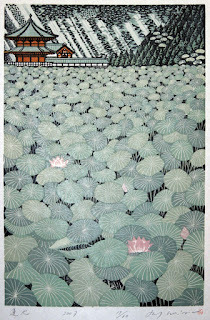 One composition Morimura uses frequently is a large foreground of a repeating pattern, with a more detailed or naturalistic focal point in the background. He certainly does plenty of pieces with other compositions, but I find that in picking my favorites I’ve selected a lot like this. I find them striking and interesting - rather different from what I usually see, and certainly different from what I’ve done myself. It’s an effective way to balance that traditional landscape scene with an abstract sensibility that glories in shapes and patterns for their own sake. 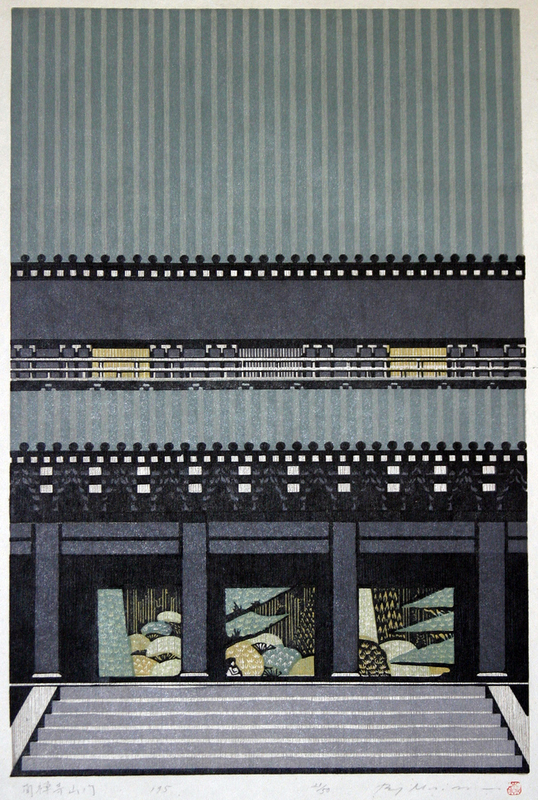 Morimura uses color, of course, with a separate block for each color. 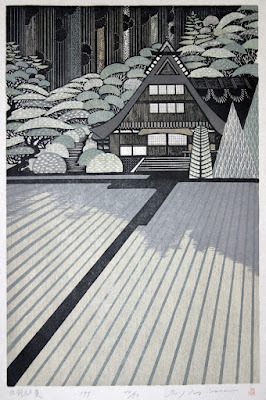 Sometimes I think colored block prints would be better in black and white, but not these. The subtle interplay of similar colors is lovely, and in some cases the different colors actually help simplify a very busy design. Without the different colors in this piece, for example, it might be hard to make out the house in the background against the pattern of the landscape, and the white cranes wouldn’t pop so beautifully. 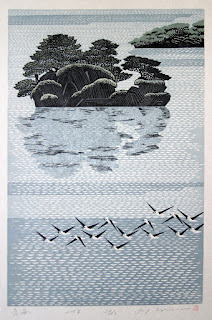 Unlike traditional Japanese wood block prints, Morimura carves some linoleum blocks as well as wood, and he uses oil-based inks instead of water-based. I don’t know why the different ink - whether it’s just that he was more used to working with oil colors from his painting background, or whether he especially likes the more opaque effect, or some other property of the different ink. 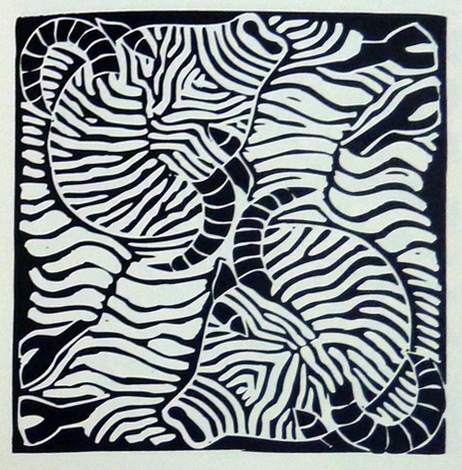 He also does the whole process - design, carving, and printing - himself, unlike the traditional method where carving and printing are done by separate workshops. 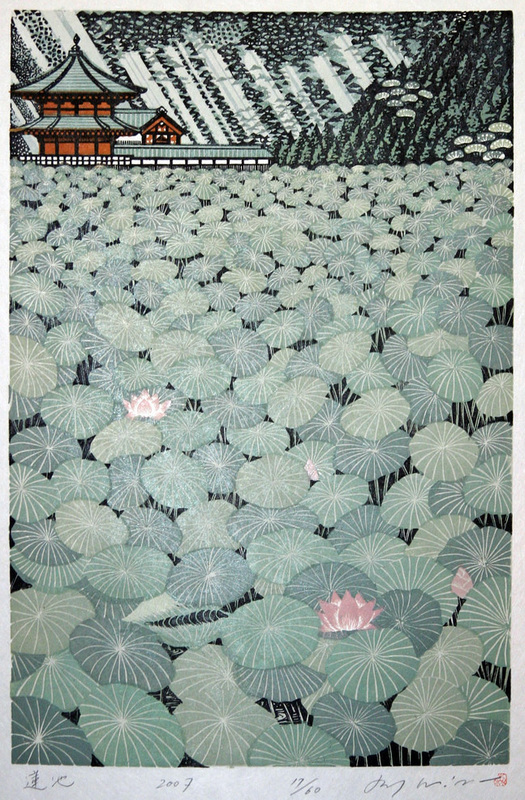 Clearly you could never mistake these pieces for traditional moku hanga, and yet they do unmistakably have their roots in that aesthetic. Think of Hiroshige’s travel images focussing on popular landmarks and everyday scenes of people in famous towns and locations. 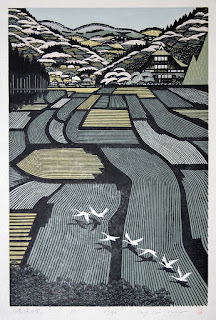 Think of the different framing and perspectives used to depict well-known landscapes. Morimura clearly continues this tradition. 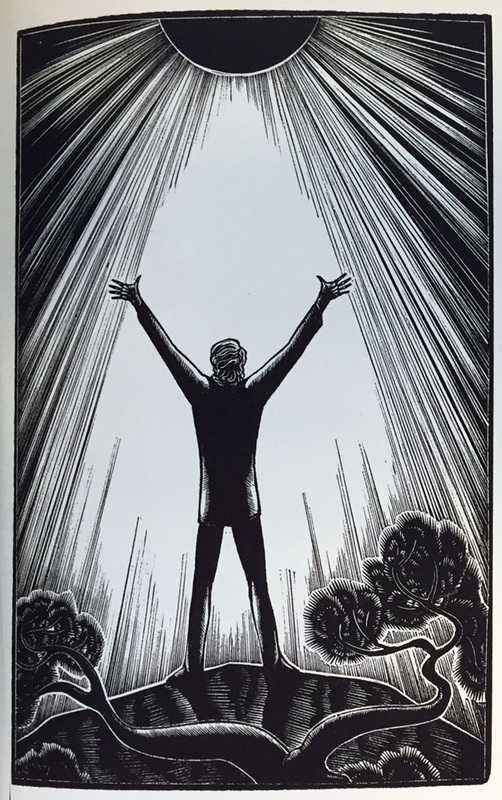 I’ve had a really difficult time choosing just a few of his pieces to share, so the best thing I can suggest is that if you like these, you should check out more. 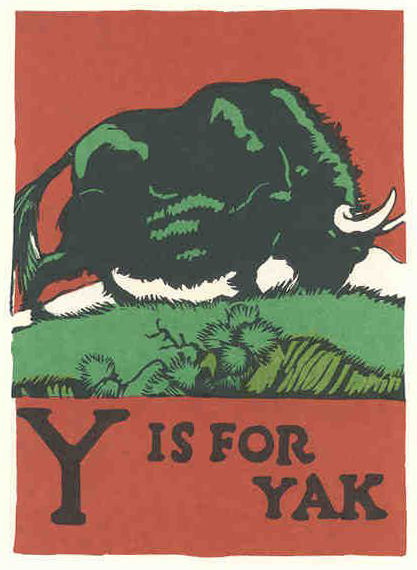 A simple search will bring up plenty, or follow the link below to where I found these images. Enjoy! The idea that the planet Earth has a substantial interior space, and that it is inhabited or inhabitable, has a long and interesting history. To begin with, there are cultures around the world, from New Guinea to India, Brazil to Canada, who believe that their ancestors first emerged onto Earth from underground realms. 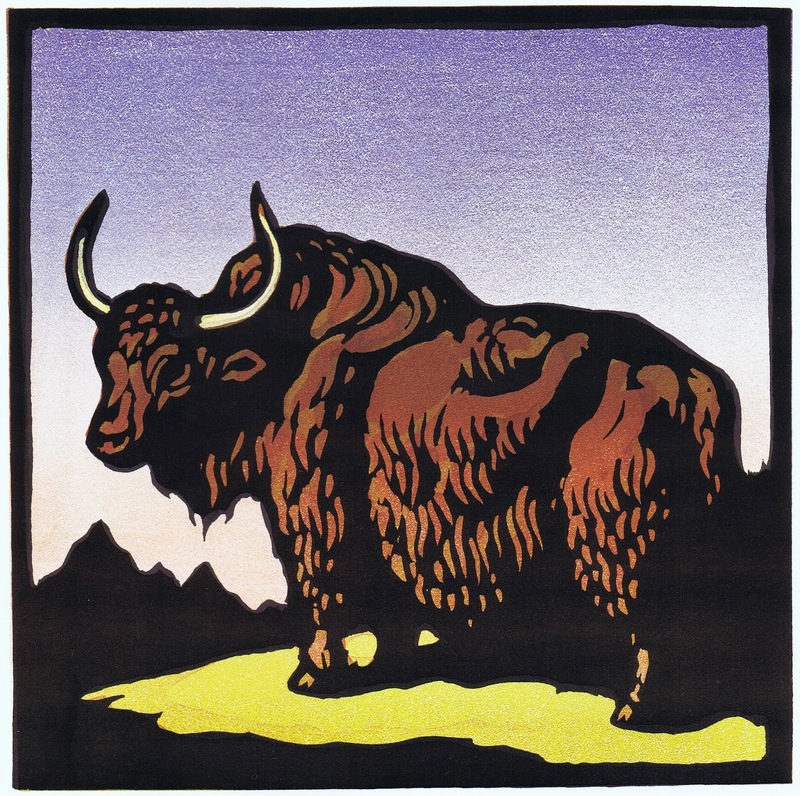 Alternately, some mythologies, such as Celtic, Mexican, Russian, and assorted native American, place non-human races as living inside the Earth. 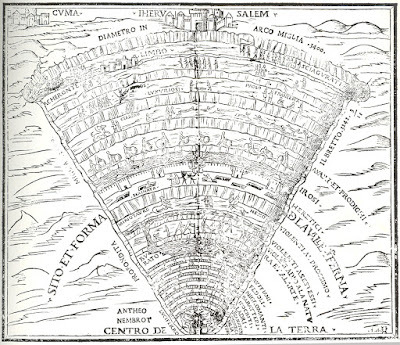 Also common in many cultures including Greek, Hindu, and Nordic, is the idea that inside the globe is the place usually translated as “hell.” As long as there have been humans we’ve been speculating about an inhabited hollow Earth. 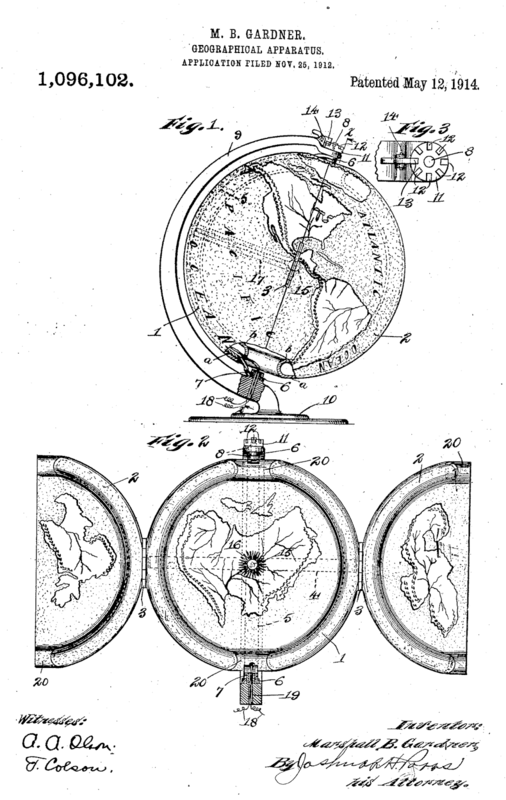 In the seventeenth and eighteenth centuries the idea of a hollow Earth was explored by European scientists. In 1692 Edmond Halley famously proposed a series of smaller concentric earths nesting inside our outer crust like matryoshka dolls. 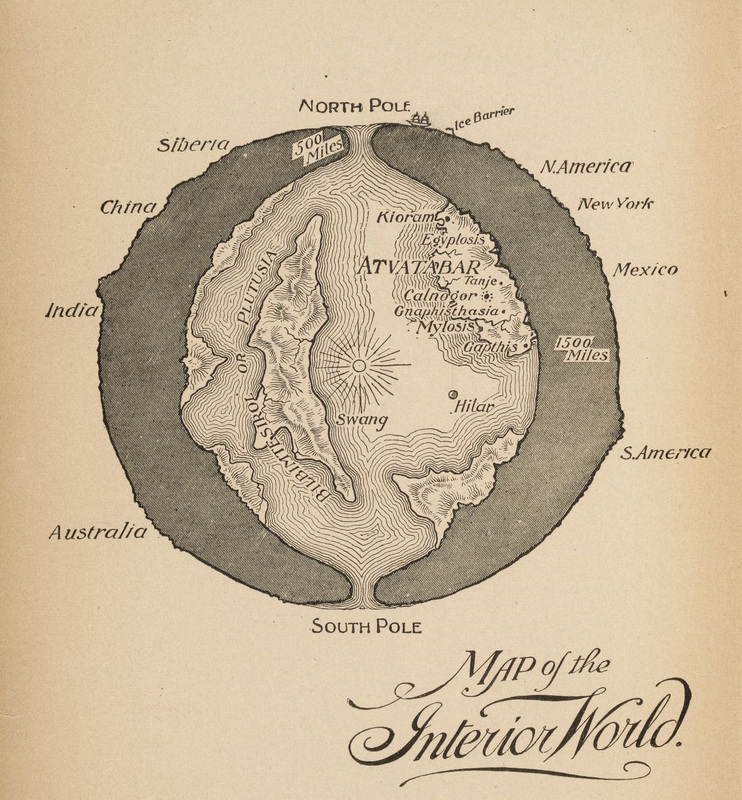 In the nineteenth century the openings to the Earth’s interior were generally thought to be at the north and south poles, and indeed this idea helped the push for exploration expeditions. 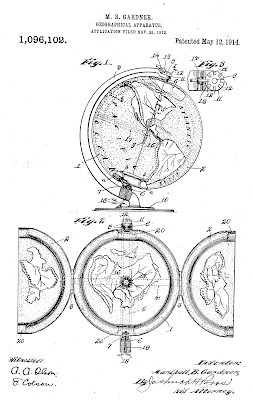 Alas, the scientific consensus is now clear that Earth is not hollow after all, but let’s ignore that for now and look at some of the ways a hollow Earth could work. One of the things I think is coolest about the hollow Earth concept is its diversity. That is, there are all sorts of different ways habitable ground could be arranged inside a sphere. The first one that occurs to me is the concave version: the interior surface of the crust we live on is the ground for those inside the Earth, and their “sky” is the vast hollow void of the sphere. If they looked straight up into the “sky,” they would see the other side of their interior Earth looking back down at them. To this concave version we further add the variations with and without a “sun,” or some luminous core to illuminate and give energy in there. There’s also the further complication of a theory claiming that a trick of light will make it seem to an inhabitant of a concave surface that they’re seeing out into an infinite universe instead of simply seeing across to the opposite side of the sphere. Then there’s the possibility that inside our Earth is nested another sphere, and creatures live on the surface of that. In this scenario their “sky” is the interior of our crust. If the interior sphere is small enough there could be room for a small “sun” orbiting around it in the space between it and our outer crust. Halley’s version is a further twist on this with four layers of Earth altogether: our surface, two more hollow shells, and a solid sphere at the center. This makes Earth the high-rise apartment building of planets, with a much vaster population possible. Halley suggested that the spaces between these layers were luminous and it was this luminous gas escaping at the poles that caused the auroras. In 1741 L. Holberg imagined a planetoid orbiting the luminous core of Earth just like Earth around the sun, and it was on this planetoid’s surface that life could be found. For more about his version, including his underground sentient tree people, see my previous post here. Holberg’s version requires Earth to be almost entirely empty on the inside. 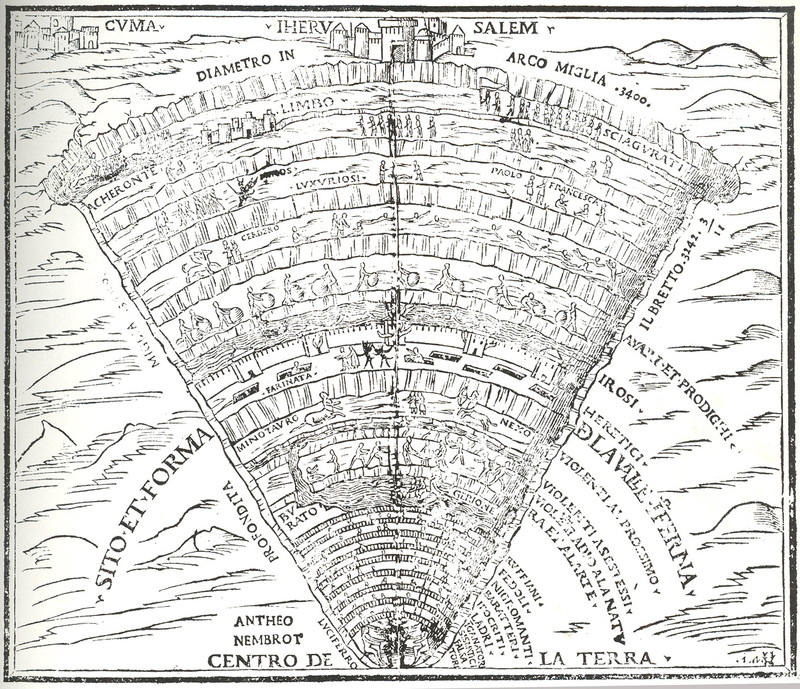 Other versions, like J. Verne’s, make Earth perhaps more like a giant Swiss cheese than an actual hollow: Earth’s interior life inhabits caves much vaster and deeper than generally known, but nevertheless mere caves in a solid matrix. Or what if the interior of Earth were filled with liquid and the life in there was aquatic? Or can you think of others ways the geometry could work? As for who or what lives inside the Earth, popular possibilities include, as previously mentioned, ancestors of various humans, or non-human species either predating humans or driven into hiding by us. Dinosaurs and other prehistoric creatures are also popular. 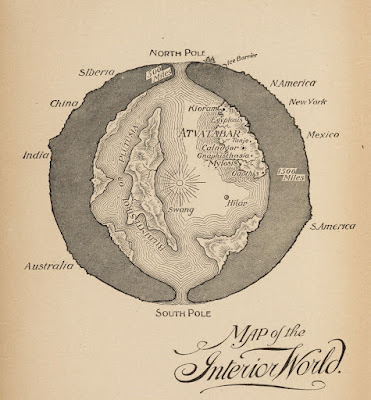 In 1907 Lady Paget said the hollow Earth was inhabited by the Atlantians. In 1964 W. Siegmeister (under the pseudonym Bernard) added that the hollow Earth Atlantians sometimes emerge in flying saucers and other such UFOS. In 1975 M. Grumley said it was inhabited by Bigfoots and their cryptoid ilk. There are so many different concepts of how the hollow Earth might work that, as you can imagine, there is no single name for the interior realm. Hades is the Greek underworld, Patala the Indian underworld. According to F. Ossendowski in 1922, the Buddhists called the interior world Agharti (or Agartha, Agartta, etc. But I don’t know of any evidence that the Buddhists did any such thing!) In 1952 De Camp and Ley suggested two interior suns called Pluto and Proserpine. (They attributed this idea to John Leslie in 1829, but that seems to be false, too.) An anonymous 1820 author wrote of Symzonia, in 1879 E. Bulwer-Lytton wrote of the Vril-ya, in 1892 W. Bradshaw wrote of Atvatabar, and in 1914 E.R. Burroughs wrote of Pellucidar. There are many others, of course, as this is one of those speculative themes whose appeal is particularly broad and enduring. 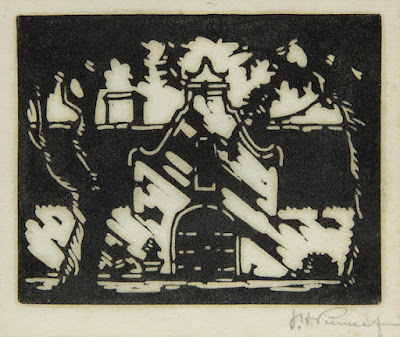 Here is a very pleasing little wood block print by South African Jacobus Hendrik Pierneef (1886-1957). He is apparently generally known as a landscape painter and was the leader of a distinctive South African style of painting in the early 20th century, but I really love his use of black and white in this first piece particularly. I love how the rough, wide strokes of carving perfectly depict the fall of shadows, and how the highlights on the tree trunks define their whole shape. I love how the architecture and the light evoke the location so efficiently and so effectively. 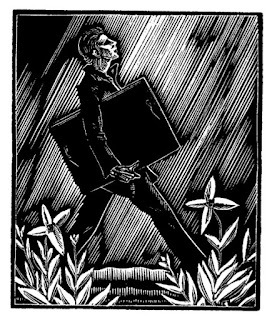 It’s really very small - only about 5x3 inches - and not very detailed, as tiny wood engravings are, yet it’s got everything it needs. 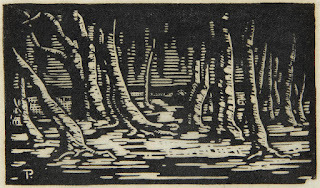 I’m not so much in love with this second piece, but I still think it’s really interesting how Pierneef has made almost the entire picture out of horizontal lines. Tree trunks, leaves, shade, ground, all are simply different variations of roughly horizontal lines and the gaps between those lines. 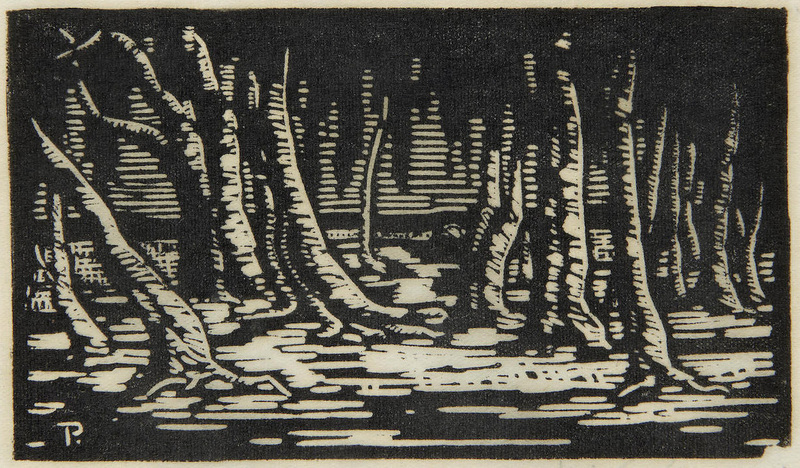 I’d love to find some more of Pierneef’s wood block prints.